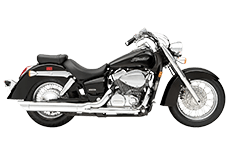 The Aero 750 has been a staple model for the Honda Shadow series of motorcycles, featuring classic lines and modern styling. At some point, owners will need to outfit their bikes with a set of saddlebags that can not only the transportation of clothing, extra riding gear and essentials, but also pair nicely with the core aesthetics of the bike. That's exactly why we feature only the finest saddlebags from Viking Bags, providing riders with ample selections to fit their lifestyle. There's something for every rider, and you can find out more info and details simply by browsing through these pages!